This could have easily been a Friday Flashback but it was just too good to wait for a Friday. A few months after Sarah Vaughan’s death in 1990, Carmen McRae?s recorded Sarah?Dedicated to You. I had this album on cassette until I finally found it on CD last year. 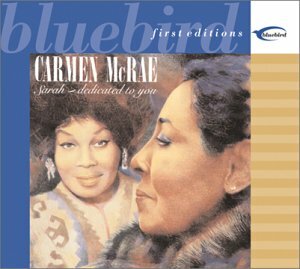 Bluebird First Editions recently reissued this classic album with four bonus tracks including “If You Could See Me Now“, “Wave“, “Embraceable You“, and an alternate version of “Sarah.” Carmen was lovingly and masterfully backed by the Shirley Horn Trio. Ironically, this wonderful tribute was Carmen’s last album. This entry was posted on Thursday, July 24th, 2003 at 7:36 pm. It is filed under Music Reviews, Shirley Horn and tagged with Carmen McRae, Dedicated to You, jazz, Sarah Vaughan, Shirley Horn Trio, vocals. You can follow any responses to this entry through the RSS 2.0 feed.